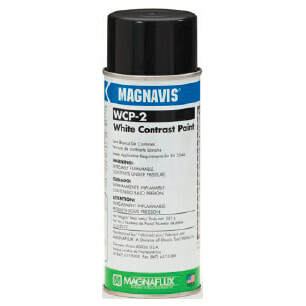 A bright white, opaque NDT contrast paint, WCP-2 provides a high contrast background to improve probability of detection and sensitivity during visible magnetic particle inspections. This fast drying paint aerosol sprays on evenly, without flaking, before inspection so when non-florescent / colored magnetic particles are applied, the indications appear clearly against the opaque white background. WCP-2 can be used with all types of colored and visible mag particles, including 7HF or 7C Black wet method particles, and #2 Yellow or #8A Red dry method magnetic powders.